One of five new restaurants opened by the nonprofit Farestart in the last year, Maslow’s in South Lake Union is its most ambitious. At the bottom of Maslow’s pyramid are the most basic human requirements: food, water, air and shelter. Since 1992, the nonprofit organization FareStart has given disadvantaged people a leg up to the next tiers — stable employment, love and belonging, confidence and self-esteem — through a food-service training program that has provided opportunities for nearly 9,000 adults and youth. Earlier this year, Amazon gave FareStart itself a big boost by donating 25,000 square feet of space on its South Lake Union campus. The company also matched $1 million in funds raised from the community. That support allowed the nonprofit to expand beyond its downtown flagship restaurant at 7th Avenue and Virginia and its cafes in Rainier Valley and Beacon Hill. 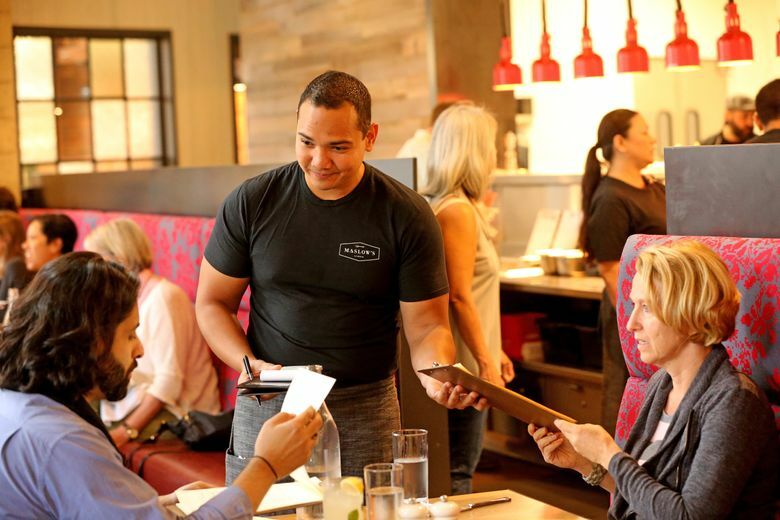 Since July, FareStart has opened Rise, a coffee cafe; Community Table, a collection of three fast-casual lunch spots; and a full-service restaurant and bar called, not coincidentally, Maslow’s. All five operations provide a training ground for a newly established apprentice program. That’s a lot for any organization to put on its plate in such a short time, but they are off to a promising start. The biggest and most ambitious of the new ventures is Maslow’s. The brick shell of a one-time radiator factory lends character to the cavernous, casual interior. Natural light spills through broad-paned windows by day. Whimsical fixtures create a starry, twilight haze after dark. The bar feels cozy and intimate, compared with the wide-open floor plan of the industrial-chic dining room. Banquettes and stand-alone tables allow flexibility for groups of all sizes to congregate, celebrate, rehash the workday or just kick back and unwind. If Amazon were a university, Maslow’s could be its Student Union. The menu doesn’t stray far from familiar Americana. It’s the same at lunch and dinner, offering sandwiches and salads, small and large plates and assorted sides, mostly seafood and meat, with a smattering of vegetarian, vegan and gluten-free choices. If I were to make my own hierarchy based on what I ate at Maslow’s over several visits, I’d put the zesty, perfectly sautéed crabcakes at the pinnacle, right next to house-smoked trout made into dainty crostini spread with caper and dill-flecked crème fraîche and sprinkled with finely minced preserved lemon. Up there, too, would be a cast-iron skillet of pull-apart buns, their golden, butter-slicked crowns speckled with smoky black sea salt, a pot of peppery strawberry jam at their side. Just below those I’d rank the exemplary cheeseburger; kalbi-style beef nuggets with fresh kimchi; and the “smoked beef dipper,” a crusty roll sumptuously stuffed with tender chuck roast and melted cheddar meant for dunking in the meat’s smoky jus. Halibut ranks high as well. It was properly seared, garnished with sea beans, and sweetly sauced with butter-enriched roasted-tomato purée. A similarly vivid tomato sauce, sans butter, surrounded ratatouille. 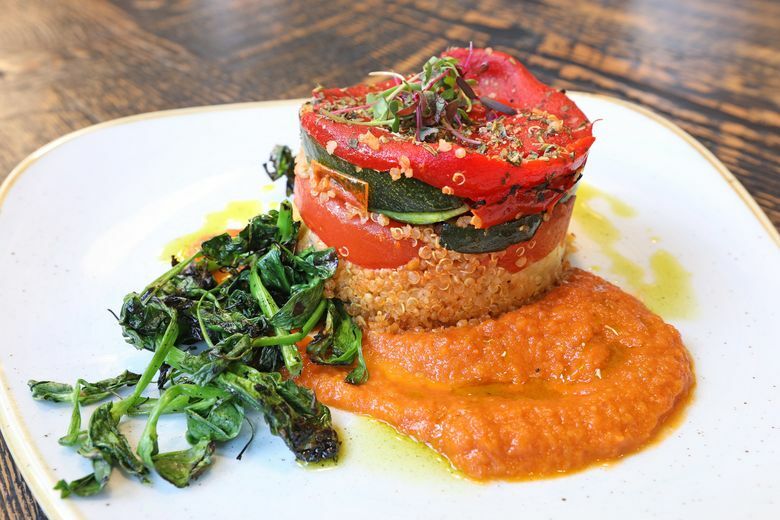 That lovely layered tower of toasted quinoa, grilled squash and sweet peppers happens to be vegan and has lingered on the menu into fall. Autumn brought more than seasonal tweaks to the menu. In September, Sarah Lorenzen replaced opening chef Skyler Gemar. For the past five years, Lorenzen was executive chef for Andaluca and the Mayflower Park Hotel, a post once held by FareStart’s corporate executive chef Wayne Johnson. His job is to oversee the food philosophies and menus for all of the organization’s restaurants, cafes and catering businesses. Her job is leading the kitchen at Maslow’s, no easy task. It requires training apprentices while also delivering a high-quality, full-priced dining experience to the public. To date, there are seven apprentices at Maslow’s, front and back of the house combined (14 total among all the new restaurants). The goal is to have 50 by the end of next year. The very first apprentice graduates this week. There were times when I forgot this is a teaching operation, and other times when the learning curve was apparent. It’s good that “crispy” was dropped from the curried-cauliflower description, because those fragrant florets are mighty limp, though they perked right up with a dab of cucumber-mint yogurt. Fried chicken was definitely crisp, but without much character and needing a better partner than viscous, salty “candied bacon gravy.” My risotto, a tricky dish that trips up many experienced cooks, was a soupy bowl of mush, though I saw better-executed versions being enthusiastically consumed at other tables. Clams came in a beer broth so drastically reduced it was a bitter sludge at the bottom of the bowl. Cioppino displayed far more finesse. The elegant seafood soup is replete with mussels, clams, shrimp and salmon in a sweet tomato and fennel broth, but it was lukewarm and contained a great many undercooked (though neatly diced) carrots. The carrots in the shepherd’s pie were cooked just right, joining peas, onions and savory ground beef in a small cast-iron baker under a spiral cap of piped mashed potatoes. Desserts tend to be geared to everyone’s inner 8-year-old. I recommend building your own Key lime tartlets or try the chill PB&J — peanut-butter semifreddo with raspberry coulis and a dusting of powdered Nutella. The staff uniforms are black T-shirts and across the back they say “Put your best foot forward.” That they do, with confidence and good cheer. You could do a lot worse with your dining dollars, or you can do a lot of good by spending them here. Providence Cicero is The Seattle Times restaurant critic. Reach her at provi.cicero@gmail.com Follow @provicicero on Twitter and Instagram.